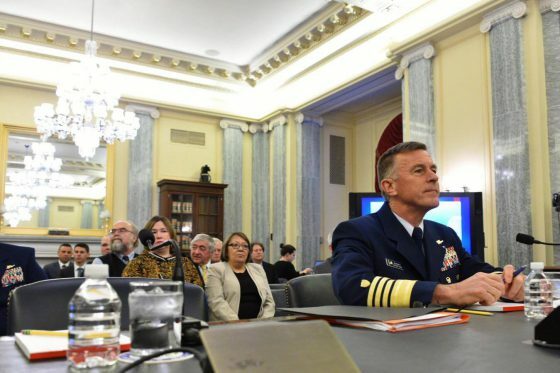 Coast Guard Commandant Adm. Paul Zukunft at the Senate Committee on Commerce, Science, and Transportation. U.S. Coast Guard photo by Petty Officer 1st Class Patrick Kelley. Good morning Mr. Chairman and distinguished members of the Committee. I appreciate the opportunity to testify today and thank you for your enduring support of the United States Coast Guard. The Coast Guard’s combination of broad authorities and complementary capabilities squarely align with the President’s national security and economic prosperity priorities and offer an agile toolset to address the Nation’s most pressing challenges. Appropriately positioned in DHS, the Coast Guard is a military service and a branch of the Armed Forces of the United States at all times. We are also an important part of the modern Joint Force and currently have forces assigned to each of the five Geographic Combatant Commanders as well as Cyber Command. As demonstrated in the 2017 record hurricane activity, the Coast Guard is the nation’s “maritime first responder” and plays a leading role in executing the National Response Framework (NRF) for disaster situations. Our bias for action and ability to rapidly surge resources in response to emerging threats or contingencies distinguishes the Coast Guard and are critical to success across the spectrum of missions we prosecute. 2 In addition to the Coast Guard’s status as an Armed Force (10 U.S.C. § 101), see also Memorandum of Agreement Between the Department of Defense and the Department of Homeland Security on the Use of Coast Guard Capabilities and Resources in Support of the National Military Strategy, 02 May 2008, as amended 18 May 2010. Supporting other agencies and the whole-of-government response effort. Coast Guard personnel are well trained and experienced in response operations, which make them a sound choice to serve in visible positions in the NRF structure. This ability to operate concurrently in both military Joint Task Force and civilian NRF frameworks enhances unity of effort and dramatically improves effectiveness. As an armed force, the Coast Guard can be a supported or supporting commander, and our forces are frequently integrated with Department of Defense (DoD) services in Joint Task Force organizations. We regularly provide forces in support of DoD exercises, Combatant Commander contingency plans, and theater security cooperation activities, all of which enable Coast Guard and DoD forces to integrate seamlessly during response operations. Saving lives in distress is our first priority, and Coast Guard crews are typically the first federal responders on-scene. As a storm approaches, Coast Guard personnel make risk-based decisions to reposition assets and people to safe locations just outside of the storm’s path, ultimately facilitating rapid response as soon as it is safe to do so. Brave men and women on the front lines make it happen, invoking a deeply ingrained bias for action to repeatedly go into harm’s way and serve others. In addition to conducting SAR operations, the Coast Guard surges forces and assets into the impacted regions to restore the $4.6 trillion maritime transportation system, respond to pollution, provide security and additional law enforcement capability, and protect offshore petrochemical platforms. The Coast Guard employs a decentralized command and control structure and distributed decision-making to provide operational commanders with the authority to move forces quickly to respond to large contingencies. Our two Area Commanders, and their nine subordinate District Commanders, shift and reallocate forces from one region to another based on risk and the anticipated demand for operational capabilities. Well-reasoned and regularly exercised Continuity of Operations Plans preserve operational effectiveness while offering safe refuge for displaced operational commanders. Coast Guard cutters, aircraft, and boats are built to respond to a variety of missions without the need for any reconfiguration or the addition of special equipment. During the recent hurricanes, cutters conducting counter-drug patrols in the Transit Zone quickly diverted to disaster areas to provide command and control, deliver rotary wing air capability from the sea, provide forward staging facilities, and deliver critical relief commodities – particularly in the U.S. Virgin Islands and Commonwealth of Puerto Rico. Coast Guard aircraft that normally perform law enforcement surveillance to thwart transnational maritime criminal activities were dynamically repositioned and re-tasked to deliver disaster relief supplies, additional responders, and equipment to affected areas. Additionally, Coast Guard forces were and are on station at key locations around the nation, most of them on short-notice recall, so they can respond quickly to emergent events. When a major catastrophe occurs, or is anticipated, we can reposition forces quickly to that area to optimize the response. Over a five week period, Hurricanes HARVEY, IRMA, MARIA, and NATE impacted over 2,540 miles of shoreline, and Coast Guard women and men in helicopters, boats, cutters, vehicles and on foot rescued over 11,300 people and over 1,500 pets. Mere hours before Hurricane HARVEY made landfall, Coast Guard helicopter crews rescued mariners in peril off the coast of Corpus Christi, Texas before repositioning to Alice, Texas. The Coast Guard resolved over 1,269 aids to navigation discrepancies, handled 290 pollution cases, located and assessed more than 3,623 grounded vessels, with more than 1,585 removed to date. Within hours after each storm’s passage, Coast Guard Damage and Recovery Assessment Teams were on-scene determining the status of ports and waterways, leveraging electronic aids to navigation when feasible to facilitate the rapid reopening of the maritime transportation system and energy sectors vital to recovery, and assessing impacts to Coast Guard facilities and capabilities. 4 Two MH-65’s from Sector/Air Station Corpus Christi saved 12 lives off a vessel taking on water in 45 knot sustained/60 knot gusting winds. Operational successes introduced real costs. Damage to Coast Guard facilities, IT, aids to navigation, and the cost of deferred maintenance are significant. Similar to any prolonged natural disaster or security event, responding to consecutive major hurricanes severely strained capacity and required us to assume additional risk in other geographic regions and mission areas. Across the recent disaster response operations, more than 3,000 Coast Guard women and men, and 200 assets or platforms deployed from places as far away as Alaska, Hawaii and Maine. As a result, the rest of the Coast Guard assumed additional risk, and units were significantly challenged to sustain maintenance and training standards while diminishing future readiness. The Medium Endurance Cutter MOHAWK, already aged and well beyond its designed service life, deferred major maintenance in order to get underway and avoid Irma. Cutter FORWARD diverted from a counter-drug patrol to provide supplies and critical command and control services after all three major hurricanes. Given the heavy demand for aviation services following each storm, training at Aviation Training Center Mobile was suspended, creating a backlog in the pilot training pipeline at a time when we are facing a critical aviator shortage. Maintaining a full-time SAR response posture at our air stations requires at least three aircraft, yet many of our units that contributed assets to hurricane operations were forced to get by with just one. Forces available for counter-drug, fisheries enforcement, and migrant interdiction operations in the Eastern Pacific Ocean, Caribbean Sea, and Florida Straits were significantly reduced as well. In total, risk-based choices to maximize hurricane response operations stretched our existing resources to their limits. The size of the Service also limits our capacity to respond to prolonged and sequential events. While the Coast Guard is well-positioned for immediate and effective first response, our “bench strength” makes it impossible to sustain these operations for an extended period of time. In addition, many of our heroic first responders suffered life-changing personal loss as well. Approximately 700 Coast Guard families’ homes were damaged to the point where they will need to be relocated. The Coast Guard’s unique blend of authorities, capabilities, capacities, and partnerships position us well for success during maritime SAR events and natural disasters. Flexible, multi-mission forces and agile command and control systems provide the solid foundation from which we base these critical response operations. When the Coast Guard has the opportunity to recapitalize our facilities, we need to make them more storm-resilient and survivable. In fact, several of our shore facilities that were rebuilt following Hurricane IKE suffered minimal damage along the paths of HARVEY and IRMA, a testament to modern building codes and standards. Modern assets bring exceptional capability, but our greatest strength will always be our people. Coast Guard operations require a capable, proficient, and resilient workforce that draws upon the broad range of skills, talents, and experiences found in the American population. Together, modern platforms and a strong, resilient workforce will maximize the Coast Guard’s capacity to meet future challenges. History has proven that a responsive, capable, and agile Coast Guard is an indispensable instrument of national security. With the continued support of the Administration and Congress, the Coast Guard will continue to live up to our motto. We will be Semper Paratus – Always Ready. Thank you for the opportunity to testify before you today and for all you do for the men and women of the Coast Guard. I look forward to your questions. Check it out for more detail. Presumably, the Coast Guard will have some role in enforcing restrictions on operations in these areas. Apparently the CG has had good long term relations with their Cuban counterparts. Today we celebrate Coast Guard Day. The Coast Guard can point to many achievements over its history, but for me, our greatest achievement was the Coast Guard’s response to Katrina. I was out of the service by then, but I watched the news reports and felt immense pride in being associated with the service. Katrina was ten years ago this month and a documentary will be aired late this month on PBS stations in Alabama, Mississippi, and Louisiana. The film is not a lavishly produced summer blockbuster, it is a student film, but was apparently a labor of love, the idea of a “Coast Guard brat.” You can learn more about the film and its genesis here and here.